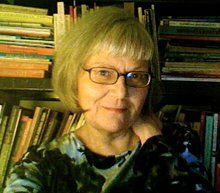 I have stories in Devil's Lake, Tampa Review, Fairy Tale Review, South Dakota Review, Storyglossia, Weber Studies, Pangur Ban Party, stet, The Writing Disorder, The Houston Literary Review, Webster Review, ragazine.cc, Stone's Throw Magazine, West, Bellowing Ark, Verbsap, and others. My poems are in Threepenny Review, Lavender, Boston Review, Parthenon West, Pank, Pool, Eleven Eleven, Fogged Clarity, Redheaded Stepchild, EAOGH, Folly Magazine, Reconfigurations, Red Fez, Willows Wept, Fifth Wednesday, Terrain.org, Minnesota Review, Saint Katherine's Review, West Wind, and others. I live in New York, write fiction and poetry, work as a fact-checker and copyeditor. The usual and the unusual. Sorry not to make a list but it will simply be a list. Hi Sarah. Thanks for the comment on Time for Rest! Lovely to meet you here; I got a chuckle out of your story this morning; will look forward to reading more! Sarah, Thanks so much for taking the time with my play, your comments very much appreciated. Thanks, Sarah for your comments on "The man who killed Molly Bloom." I appreciate your insight. Thanks, Sarah, for commenting on "Augustinian Prayer Sonnet." Glad you enjoyed it. Welcome to Fictionaut. Great place. Great people. I was also in The Antigonish Review, many, many years ago. Looking forward to reading your poems. Thanks. Still figuring things out. Fantastic to have you with us. You must log in to write on Sarah Sarai's wall.